One of the most important decisions you can make as a parent is choosing the right car seat for your child. Choosing the wrong one can make the difference between life and death. It may be difficult to talk about, but studies show that car crashes are still the leading cause of death for children under the age of three. Choosing the right car seat for your child can increase your child’s survival rate in a car crash by as much as 71%. A convertible car seat is ideal for alleviating these stresses. A regular car seat will simply fit facing forwards or backwards, and is therefore limited depending on your vehicle. A convertible car seat can be both rear and front-facing, giving you the ability to keep your child safe, no matter what vehicle you are traveling in. 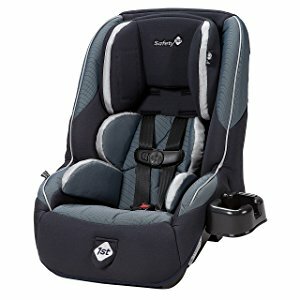 To allow you to protect your child, I’ve compiled the ultimate list of convertible car seats, showing you a comprehensive range of what’s available. 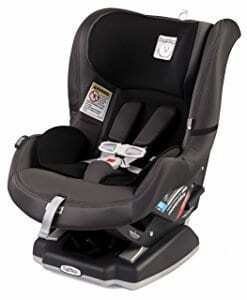 For parents who are new to the convertible car seat industry, my definitive buying guide gives you all the information you need about convertible car seats so you can make the best purchasing decision for your child. To give you some insight into the current market and to see what the best convertible car seats available today are, here is my comprehensive list of car seats to keep your child safe. To start my list, I’ve chosen a feature-packed car seat that prioritizes your child's safety. 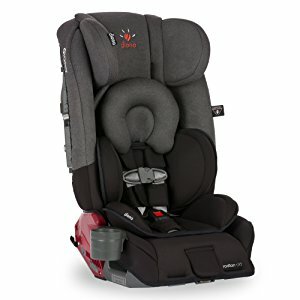 Designed to effectively work with children up to 50 lbs, one of the leading features of this car seat is the integrated steel anti-rebound system which maximizing the safety of your child. The entire body of this car seat is designed to be as durable and protective as possible. The sides of the seat pride themselves on their deep wings and advanced energy absorbing foam, all of which is securely connected to a stable and supportive metal substructure. This seat comes in an extremely compact and lightweight design, despite its many features, which means you can easily install this seat into most vehicles and you can also put three of these seat side by side in your back seat, ideal for larger families in need of optimum safety. The internal areas of the seat boast super-soft GreenGuard fabrics that provide high levels of comfort and are resistant against elements including fire, moisture, food and drink spillages, and odor-causing bacteria. What's Great About It: Included in this convertible car seat is advanced, market-leading EACT. This stands for Energy Absorbing Crumple Technology. This means that in the event of a crash, the honeycomb-style foam on the inside of the seat will crumple in such a way that it will absorb the majority of the force sustained from an impact, maximizing the protection and safety of your child. My next convertible car seat aims to be as easy to use as possible, without compromising on quality or protection. The patented ClickTight system means you can easily place the car seat into your car before passing the seat belt through it and clicking it into place. That’s all you need to do to ensure your car seat is securely in place. This seat is designed with a sturdy integrated steel frame with a V-shaped tether. This stops the seat moving while in transit or in the event of a collision. On this steel frame, you’ll find an advanced SafeCell Protection system that is used to absorb energy to protect your child. Regarding your child’s overall safety in the car, this seat prides itself on its quickly adjustable 12-point harness and an added two-position buckle. This allows you to effortlessly adjust the straps to fit your child into the seat comfortably, additionally making this seat ideal for your child as they grow up through the years. To maximize comfort, there are seven reclining options to choose from, allowing your child to remain completely comfortable in the vehicle while making sure the seat fits perfectly into your car's seating arrangement. What's Great About It: Side collisions are renowned for being the most dangerous vehicle collision. To combat this, the seat is bordered by a deep foam shell. This boasts outstanding shock-absorbing and shielding properties, providing your child with the ultimate level of protection. The Chicco NextFit Car Seat is a lightweight and elegant solution to convertible car seats that provide you with everything you need from a car seat. The seat boasts nine reclining settings that allow you to accurately and precisely install the seat into any car. While installing, you’ll find two bubble spirit levels that are integrated into the seat. This means you can be safe in the knowledge that you’ve secured the seat dead-square in your vehicle, whether you’re front or rear facing the seat. What’s more, the patented Super Cinch Latch Tightener ensures that the seat is firmly and securely locked in place. 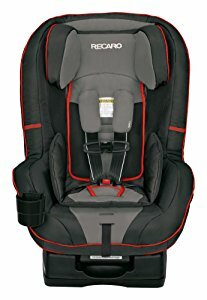 To maximize the comfort and safety levels for your child, the top of the seat sports a 6-position adjustable headrest with a customizable harness system that can be adjusted to suit your child as they grow. 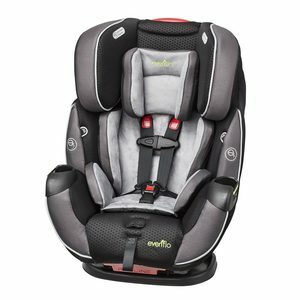 To secure your baby in place during journeys, the seat provides you with both a 5-point harness and a 2-point chest clip, both of which are easily adjustable and provides optimal safety levels for your child. What's Great About It: This convertible car seat is ideal for kids of all ages, meaning you’ll only ever have to buy this one car seat. Included with your purchase, you’ll find a detachable and easy-to-install infant insert, allowing you to safely use the seat with babies weighing 5 lbs or more. Available in three gorgeous color schemes, the Graco Contender is ideal for babies, both rear and front facing, to weights up to 65 lbs. The seat is both lightweight and easy to install, and provides you with all the safety features you need to fasten your child securely. The leading harness is the Simple Safe Harness System that can be easily operated with one hand, eliminating the need to re-thread the harnesses since the system adjusts everything automatically. Furthermore, the headrest itself boasts eight customizable positions and can also be operated with one hand, making this seat ideal for kids of all ages as they are growing up. Giving your child the protection they need, this seat has been professionally designed and meticulously tested to exceed US safety standards. What's Great About It: To protect your child in the event of a collision, the entire body of the seat is produced out of smart EPS. This is a leading form of energy absorbing foam which evenly distributes the energy from a collision with minimal impact to your baby. 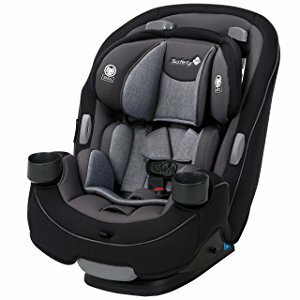 The second Britax convertible car seat to enter my list, the Advocate is available in three different colors, and is expertly researched to be as easy to use and functional as possible. 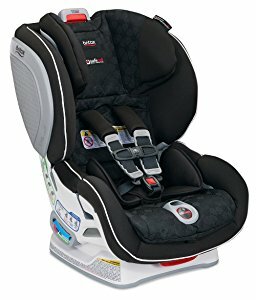 Implementing Britax’s patented ClickTight system, you can install this car seat into any vehicle in a matter of minutes simply using the seat belt. Varying from the other Britax seat, the Advocate prides itself on its audible click that is used to tell you when the baby’s harness is at an optimal tightness, maximizing both safety and comfort. The harness itself features 14 unique points of connection, and the 2-point buckle system provides your baby with all the security they need to have the safest journey possible. This is also ideal for buying the car seat when your baby is young and slowly adjusting it as they grow. 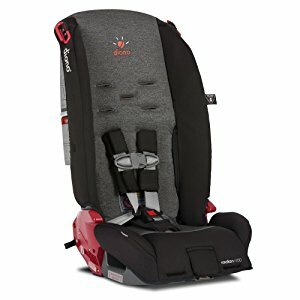 What's Great About It: The leading feature of this unique and professional convertible car seat is the expertly designed SafeCell Impact Protection technology. This grants your child three layers of highly durable protection, created from high-density, energy absorbing foam. This foam is securely fastened to the internal metal frame which helps to absorb and distribute energy from a collision, offering the highest level of protection to your child. Marketing itself as one of the only all-in-one convertible car seats on the market, the Diono car seat is suitable for children of all ages, from birth to booster seat age, meaning you’ll only ever need this one car seat. The compact and lightweight design means you can easily fit and install three of these seats side-by-side in the same vehicle, ideal for larger families. Inside the seat, you’ll find comfortable and supportive memory foam, maximizing the levels of comfort for your baby. Regarding safety, your child will be securely fastened to the seat thanks to the 5-point harness system that provides optimal protection levels when front and rear facing. The seat can also be converted into a booster seat that is capable of supporting children up to 120 lbs. All these features are securely fixed to the integrated steel alloy frame that provides superior levels of support and safety in a car seat that won’t let you down. What's Great About It: The Diono range is ideal if you’re looking for the perfect balance of comfort and safety. The fabric covers of this unique seat are inspired by leading European designs. This plush material maximizes comfort for your baby while dramatically increasing the durability and lifespan of the seat itself. Available in nine beautiful colors, this is one car seat you’ll fall in love with. The seat is designed with market-leading energy-absorbing foam known as EPS. This foam can be found throughout the seat, providing your child with protection across their bodies, in particular, their delicate head and torso areas. In the event of a collision, the shell is designed to effectively crumple while absorbing the crash’s impact, minimizing the potential damage to your child’s shoulders and neck. When forward-facing, there’s a highly durable tethered hook that increases the level of security and minimizes the amount of movement the seat has while the vehicle is moving. When rear-facing, the seat boasts high-performance latch connectors that can be easily re-positioned to provide the highest levels of stability. What's Great About It: One of the essential features that this seat provides is the integrated steel framework that’s located inside the seat, the highlight of which is the contoured steel back plate. This helps to reduce the amount of flexing in the seat while reducing the risk of forward movement. If you’re looking for a new-age convertible car seat that is specially designed to cater to your child as they grow, the Safety 1st Seat is ideal. 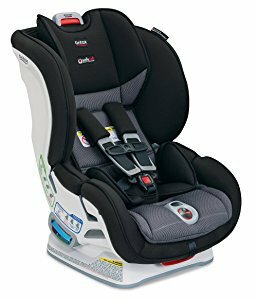 Suitable for use from weights of 5 lbs, this car seat can stay with your family for many years thanks to its ability to convert into a booster seat for children up to 100 lbs. The advanced harness system means you can easily secure and remove your child from the car seat in a matter of seconds. The harness system is easily adjustable thanks to the patented QuickFit technology where you’ll be able to adjust the harness system and the headrest in one simple movement. To protect your child in event of a collision, the sides of the seat are designed to be as durable and protective as possible, absorbing the energy that could otherwise harm your child. What's Great About It: As your child grows, they are more likely to make messes in the car with food and drinks. With this in mind, all the covers on this seat can be easily removed for easy cleaning. Furthermore, these covers are suitable for machine washing, enabling you to maintain the highest level of cleanliness and hygiene. 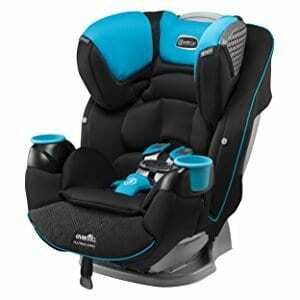 Another all-in-one car seat, and the second entry from Diono Radian. If you’re looking for a one size fits all convertible seat then this could be perfect for you. Suitable for children weighing 5 lbs or more, this seat is easily convertible as your child grows, becoming a booster seat for your kids up to 100 lbs. The lightweight and compact design means you can safely and easily fit three of these car seats side by side in one vehicle, ideal for larger families or days out with friends and their children. While traveling, this car seat can fold flat for easy transportation, but when operated, the seat gives you all the safety features you would need. Inside the seat, you’ll find a fully supportive steel framework that provides the structure and support needed to protect your child. Attached to this framework, you’ll find energy-absorbing EPS foam to create outstanding protection around the outside of the seat in the event of a crash. Additionally, all the covers and fabric parts of the seat are machine washable, allowing you to maintain the seat for years. What's Great About It: Regarding safety, this all-in-one car seat comes with multiple tethers and super-latch systems. This helps you to ensure the seat is securely fastened and installed into your vehicle. The rear-facing tether includes an audible click and a visual indicator, allowing you to be safe in the knowledge that the seat is firmly in place. Boasting an outstanding weight capacity of 110 lbs, this is one heavy-duty convertible car seat that will give you everything you need to protect your child. This all-in-one solution is capable of being converted into a rear and front facing seat, as well as a booster seat as your children grow. When you receive your Evenflow seat, you can efficiently install it into your car in less than 60 seconds thanks to the highly durable auto-retracting Sure Latch connector that does all the hard work for you. Once installed, you can safely secure your child into the seat using the exclusive 5-point harness system, allowing your child to be safe in the seat on every journey. The seat can then be positioned using the multiple-position reclining settings that are ideal for finding the optimal position for your child when they’re awake or asleep. Regarding safety, this seat prides itself on its high-performance side impact protection which has been proven to reduce the energy levels of a collision up to as much as 50%, one of the most superior car seats on the market. What's Great About It: Evenflo is renowned for being one of the leading and innovative brands, which means the product you’re buying is backed by decade’s worth of research and expertise, making this one of the most outstanding convertible car seats on the market. If you’re searching for a more affordable car seat solution, but don’t want to compromise on quality or protection, Safety 1st may have the ideal car seat for you. This simple and minimal convertible car seat is capable of being positioned both front and rear facing and can support weights up to 65 lbs, making this seat perfect for younger children. There are several adjustable parts to this seat which includes the multi-position headrest that allows you to adapt the seat as your child grows. Furthermore, the seat prides itself on its five-point harness system that makes it quick and easy to take your child in and out of the seat, and is easily adjustable for maximum comfort and protection. The lightweight and portable design means that this seat can easily be installed into any car as it’s specially designed for smaller vehicles. The compact design means you can easily fit three of these seats side-by-side in the backseat of your vehicle, ideal for larger families. What's Great About It: Available in four different colors, this convertible car seat boasts fantastic levels of protection in the event of crash thanks to the innovative side impact protection design. This is created using EPP energy-absorbing foam that takes the initial impact force and distributes it throughout the foam, protecting your child. In need of a mid-range car seat that protects your child while looking after your bank account? 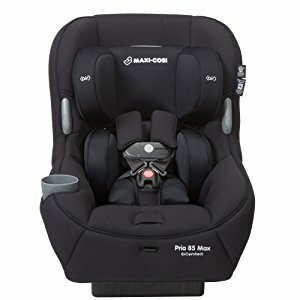 Maxi-Cosi is one of the leading convertible car seat brands, offering their latest car seat as an affordable solution that can be enjoyed by all families. This convertible seat has some really impressive specs for the price, with the ability to protect children weighing 5 lbs to 85 lbs. Regarding impact protection, this seat prides itself on its innovative Air Protect technology, an advanced air cushion system that is integrated into your child’s seat to maximize collision protection. Taking your child in and out of the seat is a breeze thanks to the patented ClipQuik magnetic system on the chest harness that makes securing your child into the seat take just a couple of seconds. Furthermore, there’s a multi-point harness system and a flip away buckle that locks your child in place, ensuring they’re secure and safe for every journey. What's Great About It: One of the leading features of the seat is the levels of comfort it provides for your child. The Pria 85 seat includes a seat pad and padded harnesses to maximize comfort to ensure your child is as happy as possible in their car seat. These high-quality, highly durable fabrics are easily removable and can be machine washed, allowing you to maintain cleanliness while persevering the lifespan of your car seat. Available in five vibrant and attractive color schemes, the Graco Convertible Car Seat is ideal for families looking to purchase a car seat that is built to last. 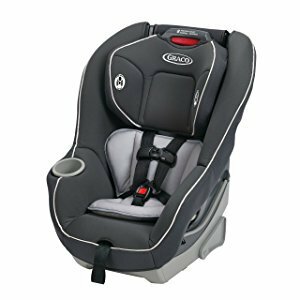 Marketed as the only car seat you’ll ever need, the Graco seat is designed to give you up to ten years of use, capable of suitable for weights of 4 lbs to 120 lbs. What’s more, you can easily install and secure this car seat into any vehicle thanks to the innovative and game-changing 1-second Latch system. Adjust-ability is maximized thanks to the fantastic ten-position head rest and six-position reclining system. 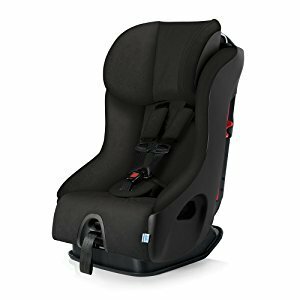 This enables you to safely install the seat into any position while being safe in the knowledge that your child is subject to ultimate levels of comfort and safety. There are also two integrated cup holders for your child’s drinks while on the move. The seat has been specially designed to withstand extreme car temperatures on hot summer days while the seat itself is produced using highly durable steel composite with added EPS foam that will absorb any kinetic energy in the event of a collision, double the industry standard. What's Great About It: In addition to being meticulously tested and surpassing the US safety standards, this outstanding seat has fully surpassed the NCAP (New Car Assessment Program) certification, making it one of the safest and top performing convertible car seats on the market. Priding itself on being the only car seat you’ll ever need, my second entry from Evenflo is a feature-filled seat that doesn’t hold back. With the ability to support and protect children from 5 lbs to 120 lbs, this seat is perfectly capable of staying with your family for years to come, fully adjustable to suit your children as they grow. This seat is lightweight and extremely portable, and thanks to its pioneering Quick Connector LATCH system, you can easily install this seat into any vehicle in under a minute, saving you time while leaving you safe in the knowledge that the seat is secure. When it comes to comfort, Evenflo once again excels. The seat is covered in Outlast Performance materials that provide your child with superior levels of comfort while remaining breathable enough to circulate air, maintaining an optimal temperature for your child. The buckles and straps tuck away neatly, even while in use, which minimizes the risk of your child becoming burnt by hot straps on a warm summer’s day. What's Great About It: Easily the best feature about this seat is that it’s the first ever convertible car seat to have passed a car rollover test. In the event of a large collision where your vehicle may flip, this seat sets out to reduce the risk of injury to your child. To complement this feature, the interior of the seat boasts a solid steel framework and impact-energy absorbing foam. To conclude my list, I’ve chosen a fantastic all-rounded car seat that’s both affordable and gives your child everything they need to be safe and comfortable. The advanced design contains high-impact energy absorbing properties that help to protect your child in the event of a collision. This design continues to impress thanks to the ergonomic design that has been specially tested and researched for superior levels of comfort and safety. The design and style have been based on a racing theme that helps to create this gorgeous look that is suitable for any kind of vehicle and is completely neutral when it comes to the gender of your child. At the core of the seat, you’ll find a sturdy steel framework that provides the foundation for the outstanding levels of support. Moving outwards, there is foam on top of which you’ll find Cloud Comfort Memory Foam, implemented to nurture your child’s body for superior levels of comfort. What's Great About It: To further increase the safety levels, you’ll find a twist-resistant, patented HERO harness that is specially designed to fit over your child’s neck, chest and shoulders. This feature gives them a comfortable ride no matter where you’re going while continuously adding layer upon layer to the already high levels of safety. Now that you have an understanding of some of the best convertible car seats available, it’s time to pick the perfect one for you. There are so many different brands and features involved in producing a high-quality car seat; it can be overwhelming trying to make the best decision. To give you a helping hand, here is my step-by-step guide to ensure you’re making the perfect purchasing choice. One of the first aspects you’ll want to consider for your new car seat is the harness system. There are many different factors that go into making a good harness system that we’ll discuss here. It’s highly recommended that you don’t choose a car seat with a harness system with less than 5 points. With a 5-point system, you’ll have a strap for each shoulder, one for each hip and one that goes between their legs. This has been tried and proven to be the industry standard when it comes to safety in car seats and will be more than enough. If you have an extra active child or are concerned about your child’s safety, more recent models of car seats include an outstanding 12-point harness system that will maximize your child’s safety, especially in the event of a vehicle collision. Besides being used for seating your child into an adult seat in your vehicle, many companies have realized that they can incorporate materials, such as energy absorbing foam, that can reduce the risk of injury to your child should your vehicle become subject to a crash. This is achieved by the seat actively absorbing the energy that the vehicle receives through the impact and effectively stops it from affecting your child. You will usually find this foam on the sides of the chair and around the neck, head and shoulder areas, the most delicate parts of your child’s developing body. It’s highly advised that you choose a car seat with side-impact protection. We’ve all experienced or witnessed the struggles of trying to put a baby in a car seat. 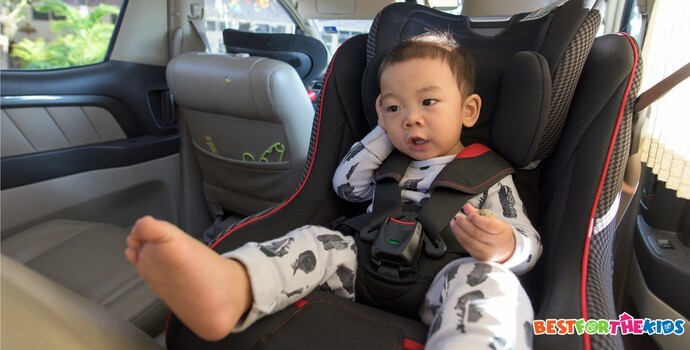 A tantrum, which includes lots of tears, kicking and screaming, has been known to occur frequently, and this is something that car seat manufacturers have kept in mind. To counter this issue, the car seat you choose needs to be as easy to use as possible, allowing you to safely and securely lock your child into the chair, minimizing the risk of a tantrum. 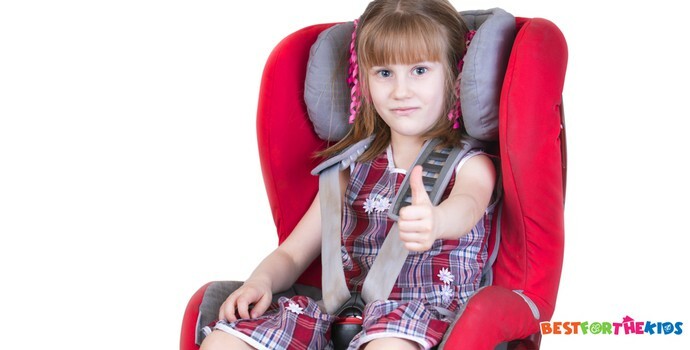 The time it takes to put your child into the seat depends on a lot of features, the main one being the harness system. This is combated by easily adjustable settings that come with most modern seats. This means you will simply have to pull a cord or strap and the seat will automatically move the rest of the straps accordingly. 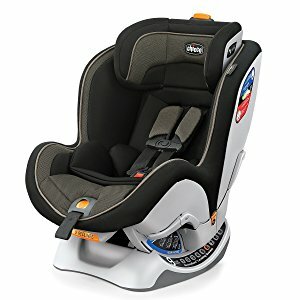 If you have an extra active baby or one that hates being put into their car seat, this type of seat will be perfect for you. As we mentioned above, adjustability is a key factor to consider, not just for saving time, but for your child’s safety. You don’t want to keep buying a new car seat, every time your child gets too big for it. The best way to solve this is to purchase a car seat that can accommodate your child as they grow. This means looking into extra features such as an adjustable headrest and adjustable harness straps that can cater for children of all ages. 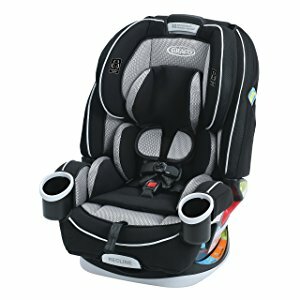 Some of the leading brands supply these features with their car seats and can go all the way from newborn to ten years. Installing your seat correctly into your car is vital. Incorrectly installed seats are the leading cause of child fatalities when it comes to a crash. A LATCH system is a newly developed system that allows you to pull a cord outside of the seat and then plug it into your existing seat belt socket. The LATCH system will then automatically retract, creating the right amount of tension to secure the car seat in place. This means you can install your seat correctly on the first attempt, in a matter of seconds. If your child is in the car seat eating food or drinking, chances are they are going to make a mess, more so if you’re dealing with toddlers and younger children. To keep your seat as hygienic and clean as possible, look for car seats that have easily removable fabric cushions that are also machine washable. This means you can finish your journey and deal with your child before removing the covers, and washing and drying them in the shortest amount of time. This way it’s incredibly easy to ensure your child’s seat is clean and hygienic. As stated above, some children just don’t like being in car seats. For the health, wellbeing, and safety of your child, you’re going to want a comfortable car seat. These are usually found by checking the padding of the seat which should support all areas of your child’s body. Alternatively, more modern, high-end chairs will come with memory foam backs, allowing your child to sink into the seat whether they’re awake or ready for a nap. Choosing the right car seat for your child is one of the most important decisions you’ll ever have to make. Too many people don’t do their research or overlook some of the key elements that go into making an outstanding car seat. By making the right decision, you’ll be protecting your child and potentially saving their life.